Shouldering a hefty amount of expectation on its broad, metallic shoulders, Titanfall deployed from orbit onto PC and Xbox platforms in 2014 without a single-player campaign. In its place, developer Respawn adopted a design approach that allowed the narrative and multiplayer component to run in parallel which proved to be unique, yes, but largely underwhelming. Whether Titanfall required a plot to begin with is something we’ll leave to you, but it’s fair to say that the implementation of said story resulted in a confusing mess of rogue agents, galactic warfare and a familiar world of guerrilla fighters and power-mongering conglomerates. That’s not to say that the narrative underpinning Titanfall was ostensibly bad, but when the entirety of the story is relayed through radio clips and/or relegated to a small corner of your HUD, there’s only so much empathy you can evoke. It was story without exposition, and while Respawn has candidly admitted that a lack of resources was to blame for the lacklustre plot, Titanfall 2, with its fully-fledged campaign, represents an opportunity to drastically expand the sci-fi lore. Heck, with a TV spinoff series also in the works, it’s clear the studio has invested a lot of faith in its budding new franchise. To combat this added development strain, Respawn recently conducted a hiring spree, expanding its core dev team by close to 30 percent with the option of growing further still. It’s hardly surprising that the studio has drafted in new creators, given that Titanfall 2 will be built from the ground up with current-gen consoles in mind, but how this fresh wave of talent impacts the story is perhaps most exciting of all. A cornerstone of that crack team is Jesse Stern, whose past credits include TV series NCIS and most enticing of all, Call of Duty 4: Modern Warfare and Modern Warfare 2. Stern may have been a part of the original team that helped nurture Titanfall into a bona fide success, but in preparation for its multi-platform sequel, the scribe has placed his proverbial crosshairs on a world that is grounded, dirty and ultimately, human. Hardly themes that will revolutionze the sci-fi genre, though Respawn is more concerned with drawing from the real-life conflict of the American Civil War, unpacking its core history of colonial warfare and firing it into the inky blackness of space. For on the final frontier, societal rules are fragile at best. It’s the wild west out there, and as the remnants of humanity begin to extend their reach far beyond the solar system, the next generation of immigrants have spent more time fighting one another than colonizing the stars. Yes, Titanfall 2 continues to chronicle the intergalactic spat between the Interplanetary Mining Corporation (IMC) and the Militia. In the words of Stern, Respawn’s sequel, buoyed by a fully-fledged campaign, will explore how those pioneering machines, once designed to terraform an alien world to sustain human life, become warped into instruments of war. So we are doing our best to deliver a vision of grand global colonial warfare retelling the story of the American Revolution and the American Civil War in space. We imagined the next generation of immigrants moving out to the new frontier of an inhabitable planet. Rather than taking a traditional sci-fi approach to that we wanted to look at how that would happen practically, what the ships would look like and with machines that were designed for excavation and construction , demolition and working the land, and what happens when they are turned into instruments of war. It’s certainly an interesting and evocative pitch, and one that will hopefully lend dramatic heft to Titanfall’s futuristic warfare — dramatic heft that was sorely lacking in the 2014 original. Because there’s no question that, despite bursting out the gate with all the kinetic energy of a skilled pilot, Respawn’s maiden title witnessed a steep drop-off in users once the studio’s post-launch support culminated with IMC Rising. Alas, it was one of the many titles caught between the recent console transition. Titanfall may play like a dream at times, and the free-flowing movement system is enough to give even Mirror’s Edge a, ahem, run for its money, but two years after release and Respawn’s mech-shooter is already beginning to show its age — like a coating of rust creeping over the game’s steely exterior. Much like Evolve and even Star Wars Battlefront, a missing campaign inevitably called Titanfall’s staying power into question. Make no mistake, all three titles have carved out varying, but no less dedicated player bases since making their bow. But by committing to an online-only infrastructure — Battlefront’s single-player game modes notwithstanding — both Evolve and DICE’s licensed title fall into the games-as-a-service camp, where developers pump out new content in the months after launch to keep those servers busy and trigger fingers a-twitching. It’s limiting, of course, in the sense that a multiplayer-focused template doesn’t necessarily lend itself to the sequel treatment. From purely a design standpoint, MOBA-styled shooters in the vein of Battleborn or Blizzard’s Overwatch are arguably about as close to evergreen status as a shooter can become; developers map out core gameplay mechanics, maps and the like, before gradually fine-tuning the formula — be that through new content or technical fixes — over time. 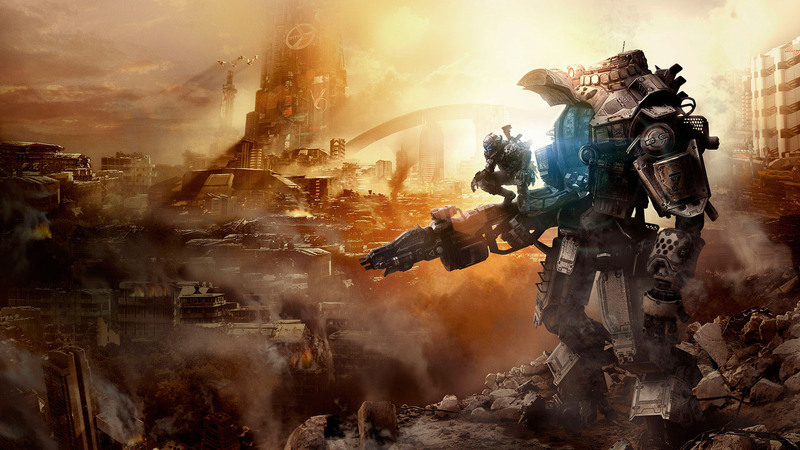 Currently, Titanfall falls somewhere in the middle of that shooter spectrum as Respawn continues to shape the identity of its budding new franchise. Indeed the decision to implement a single-player campaign puts the studio’s IP in direct competition with Call of Duty and DICE’s Battlefield series — if it wasn’t already — as it shoots for a similar portion of the genre’s massive audience. Scrapping for shooter supremacy will be a tall order for Titanfall 2 — story campaign and all — but given the original carved out a healthy install base of over 10 million players, coupled with the expansion to new platforms, there is already a tangible momentum building towards the sequel’s arrival. Speaking of which, Titanfall 2 has its crosshairs locked on a late 2016/early 2017 release — all we know for sure is that EA will launch Mass Effect: Andromeda, Titanfall 2 and a new Battlefield before March 2017. Nevertheless, come June 12 (1:00pm PT/4:00pm ET), we’ll get our first peek at actual gameplay, giving us a better indication of how Respawn’s sequel is shaping up and, crucially, that single-player campaign. Besides, you know what they say about the importance of nailing a second album. Should the stars align, a multi-platform Titanfall 2 replete with a solo campaign has all the makings to be a defining release for Respawn — for better or worse.